In 1870, Alfred Russell Wallace successfully demonstrated the curvature of the Earth to answer the challenge put forward by a flat-Earther, John Hampden. Hampden was a disciple of Rowbotham, who was a significant influence on flat-Earth movement back in the day. Rowbotham had previously used the Bedford Canal to prove the non-existence of Earth’s curvature. He looked through a telescope from one end of the canal and was able to observe boats on the other end. He raised the entire experiment by 13 ft 3 in (4 m) above water. In contrast, Rowbotham did his experiment only 8 in (20 cm) above water. He added a pole with two discs in the middle of the canal for observational aid. This way, if there’s a curvature, it would be easy to observe. In the experiment, Wallace successfully proved the existence of Earth’s curvature. Unfortunately, Hampden was not an honest person. He didn’t allow Wallace to take the wager. Instead, he made various threats to Wallace and his friends over the years and as a result, was put in jail many times. On January 12, 1870, John Hampden, a flat-Earther and a disciple of Samuel Rowbotham, wrote in Scientific Opinion magazine and challenged scientists to prove the existence of Earth’s curvature. He offered £500 as a reward for anyone who could prove it. A cash-strapped Alfred Russel Wallace thought he would earn easy money. He answered the challenge and made the demonstration on the straight and 6-mile long Bedford River (9.7 km). He is the same Alfred Wallace who was a notable biologist and conducted various research in many places in the world. The Old Bedford bridge, about six miles off, was of brick and somewhat higher. On this bridge I fixed a large sheet of white calico, six feet long and three feet deep, with a thick black band along the centre, the lower edge of which was the same height from the water as the parapet of Welney bridge; so that the centre of it would be as high as the line of sight of the large six-inch telescope I had brought with me. 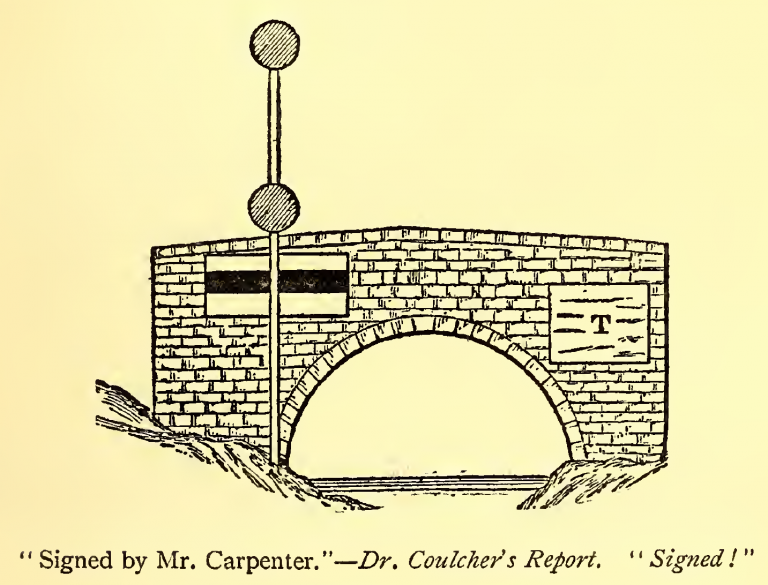 At the centre point, about three miles from each bridge, I fixed up a long pole with two red discs on it, the upper one having its centre the same height above the water as the centre of the black band and of the telescope, while the second disc was four feet lower down. 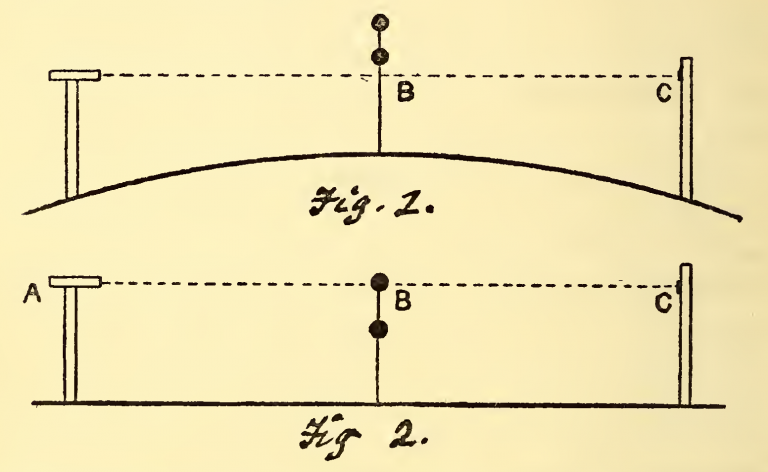 whereas, if the six-mile surface of the water is convexly curved, then the top disc would appear to be decidedly higher than the black band, the amount due to the known size of the earth being five feet eight inches, which amount will be reduced a little by refraction to perhaps about five feet. In the illustration above, the top picture is what would happen if the Earth is flat, and the bottom is what would happen if the Earth’s is curved. The experiment was approved by all the involved parties, including Hampden and the referees. When the experiment was in progress, Wallace was always accompanied by Hampden or the referee, and he made sure the height of all the three objects were the same. It is clear that both discs were seen above the black band, and Wallace’s hypothesis was correct. Unfortunately, Hampden did not take the result well. 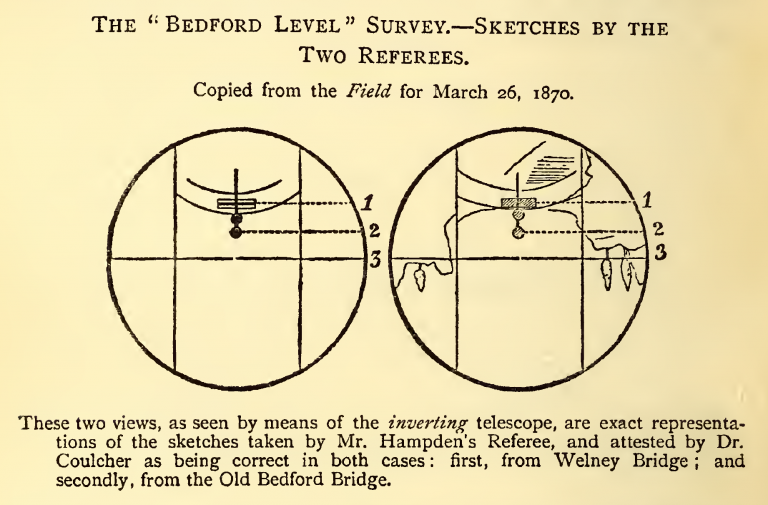 He argued that the telescope was not flat and does not have cross-hair. It was undoubtedly a made-up excuse and had absolutely no relevance to the experiment. Wallace did follow his request, though, and borrowed a level and a telescope from his friend. In the second observation, the result, as it should be, appeared the same. Wallace also did his experiment in the opposite direction. He put a flag on the Welney bridge and moved the telescope to the Old Bedford bridge. The result was also the same: both discs were visible above the flag. All the observations indicated both of the discs were seen above the black band (and the flag), so it was concluded that the water has curvature, as seen below. Wallace designed the experiment in a one-sided fashion, giving an advantage to Hampden. He did this by making the second disc below the top disc to ensure Hampden accept the experiment. All the referees and the representatives of Hampden agreed that Wallace had won the challenge. But the story did not end here. Hampden demanded Wallace to return his money! At the time the money was still in the hands of a referee and had not been handed to Wallace. Unfortunately, the court ruled that the money was still in Hampden’s right because it had not been delivered to Wallace, probably because no written agreement was enforceable in the eye of the law. And it was very far from over. Over the next 16 years, Hampden repeatedly made threats to Wallace and the people involved in the competition, including one of the referees. Hampden sent letters to people who knew Wallace and accused Wallace of being a liar. Wallace’s wife also received threats of murder. For this offense, Hampden was imprisoned for three months. But once free, he returned to his behavior again. In 1871, one referee of the challenge sued Hampden for defamation. Hampden was sentenced to 1 year in prison. In January 1871, Wallace sued Hampden for defamation. The court ruled Hampden had to pay Wallace £600. But Hampden had cleverly transferred all his assets to his son-in-law so that he had no asset. For this, Wallace ended up having to pay the court fees. In October 1872, Wallace sued Hampden for defamation once more. The court let him go because Hampden published an apology through several newspapers. In January 1872, Hampden again committed defamation and was ‘forced’ to publish an apology through several newspapers. But only a few months later, Hampden was back in the defamation business, and he was sentenced to prison for two months. In March 1875, Hampden was again imprisoned for defamation charges, this time for one year, and two years living under surveillance. But Hampden was released after only six months in prison. In January 1876, Hampden filed a lawsuit against Walsh, one of the referees to regain the £500 challenge prize. But since Wallace had a debt of £687 due to previous charges, Wallace tried to pay the debt using the receivables. Hampden cleverly made himself bankrupt and transferred all of his assets to his son-in-law. In the end, Wallace ended up paying the entire court fee of £277, not counting other fees. In 1878, once again, Hampden sent letters to Wallace’s colleagues. In 1885, Hampden sent a letter to Huxley, the president of the Royal Society, to defame Wallace. Wallace thought he would get an easy £500, and the experiment was merely a matter of science. It was far from it, Wallace needed to spend plenty of time and money to deal with the Hampden problem. Like a lot of things in the flat-Earth state of affairs, it is not merely a matter of science, but also a psychological problem.